Effective in 2018, we merged Kentuckiana Wire Rope & Supply (an Indiana corporation), Tri-State Wire Rope Supply (an Ohio corporation) and Vernon Lifting Products (an Indiana corporation) into Fulcrum Lifting LLC (an Ohio corporation). Going forward, Kentuckiana Wire Rope & Supply in Jeffersonville, Indiana will continue to operate as Kentuckiana Wire Rope & Supply and Tri-State Wire Rope Supply in Cincinnati and Dayton, Ohio will continue to operate as Tri-State Wire Rope Supply. 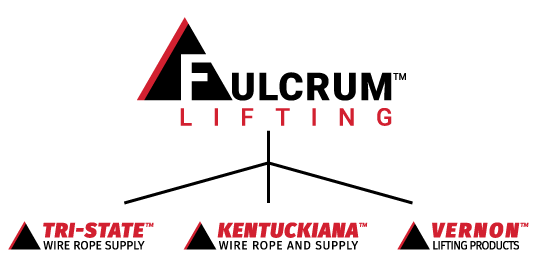 Fulcrum Lifting LLC was formed in 2016 to serve as the parent company of Kentuckiana Wire Rope & Supply, Tri-State Wire Rope Supply and Vernon Lifting Products. Since then we have worked to consolidate administrative functions, gain efficiencies and support future growth. We look forward to assisting all of our customers with their lifting and rigging challenges.